Copyright © 1997, 2000, 2002, 2005, 2008 Aaron Shepard. All rights reserved. Though The Journey to the West is considered the final word on these adventures, it draws on a tradition going back nearly a millenium. Sanzang—or Tripitaka, by his Buddhist name—was a real seventh-century monk who made a perilous journey to India to study with Buddhist masters and to gather scriptures. His story was picked up first by Buddhist preachers, then by professional storytellers and authors, who improved on it, added characters, and created new episodes over the course of centuries. As with today’s most popular comic, TV, and movie series, new adventures were always welcomed by the public. No one knows for sure when the character of Monkey was added to the story or where he came from—though he may be an adaptation of Hanuman, the monkey king of India’s epic the Ramayana. In any case, Monkey showed up in printed versions by the thirteenth century. By the sixteenth century, when The Journey to the West was written, he had taken over as lead character, overshadowing the Buddhist monk. There is good reason for the popularity of Monkey among the Chinese. Perhaps every culture has a folk hero who represents the rebel, the troublemaker who defies authority. Stories of such heroes are needed to help work off people’s resentment toward real authorities not easily defied. And nowhere has this need been greater than in China, with its tendency toward overblown bureaucracy and its strict ethical training of obedience to “superiors.” Yet that strict training itself makes it difficult for the Chinese to accept a rebel as hero. The solution to this problem is Monkey. By making the rebel an animal, the Chinese can laugh at his antics without guilt, while subconsciously admiring his defiance of the powers that be. After all, no one expects a monkey to know better—especially one with no parents! Monkey’s adventures provide a breathtaking, whirlwind tour of Chinese mythology. But some elements of this tour may at first puzzle a Western reader. For example, the rulers and officials of heaven and hell may conveniently be called gods, but they are not gods as found in Western mythologies. All were born human, then gained supernatural power by promotion to divine status. In fact, each of these deities is due to be reborn on earth, at which time the position left vacant will be filled by someone else. We may also be perplexed by the way competing mythologies all seem jumbled together. In Western culture, people generally take their beliefs from the one religion they belong to. But only a small minority of Chinese have ever belonged to any of the three most important named religions of China—Confucianism, Buddhism, and Taoism. Most Chinese instead practice an unnamed and unofficial “folk religion” that has adopted elements of all three. The mythology of this folk religion draws especially from Taoism and Buddhism, and it is this fabulous world that is portrayed in The Journey to the West. So we find a Taoist Heaven coexisting with a Buddhist Western Paradise, while Taoist venerables like the Jade Emperor and Lao Tzu hobnob with Buddhist luminaries like Kwan Yin and the Buddha himself. Buddhism, brought to China by Indian missionaries in the first few centuries A.D., is today fairly familiar in the West. Taoism, on the other hand, is less well known and little understood. Tao (pronounced “DOW,” rhyming with “cow”) means “the Way”—a poetic description of the harmonious guiding force of the universe, as well as of the path to attunement with it. Taoism developed as an organized religion in the second century A.D., with all the popular trappings of priests, temples, and ceremonies. But long before that—since at least the middle of the first millenium B.C.—it existed as a spiritual discipline similar to the yoga systems of India. Like the Patriarch Subodhi in the story of Monkey, the followers of this branch of Taoism were ascetics living in mountain hermitages. The Journey to the West presents ascetic Taoism in the Chinese popular conception—in other words, greatly simplified and literalized. For example, according to the Taoist ascetics, the final stage of spiritual discipline was to become an Immortal. This was done by developing and strengthening a conscious “spirit body” that either left the physical body before death or absorbed the physical body by transforming it into pure energy. But all this was simplified in popular legend, and Taoist masters were believed to develop physical bodies that lasted forever. Most Chinese were also a bit confused about another element of Taoism. Like some other spiritual traditions, ascetic Taoism cloaked its descriptions of spiritual practices in the language of alchemy—and as with those other traditions, outsiders often took the descriptions literally. So while the ascetics created metaphoric Elixir of Life through meditation, others tried to create it chemically, in hopes of producing “pills of immortality.” As reflected in popular legend, most Chinese saw this alchemy as part of authentic Taoist practice. Ascetic Taoism survived and evolved alongside organized Taoism, and it exists to the present day. What’s more, offshoots of ascetic Taoism—like tai chi, acupuncture, and the healing art of Chi Kung—enjoy widespread use in China and have become increasingly popular worldwide. But under the Chinese Communist government, many Taoist masters were killed, while others went abroad or into hiding. So ascetic Taoism has now almost vanished from China itself. Following are explanations of other major elements and characters in this retelling. The Chinese folk Heaven, drawn mainly from Taoist mythology, is modeled closely on the government of the Chinese emperors. In other words, it is a bloated bureaucracy, crammed with innumerable officials with pompous titles, with a finger in every possible earthly activity. All these heavenly officials are humans whose merit in their earthly lives earned them their positions. These officials are generally benevolent. For example, the job of the Minister of Epidemics is to prevent epidemics. But they are not always effective. Lao Tzu, Cinnabar Palace, Crucible of the Eight Trigrams. Lao Tzu, popularly considered to be now a divine being, is the legendary founder of Taoism. His name is actually a title meaning “Old Master.” He is said to have lived around the 5th or 6th century B.C., though we cannot be sure he actually lived at all. He is supposed to have written the Tao Te Ching (“Book of the Way”), the primary text of Taoism and the most famous of all Chinese classics. In the Chinese popular mind, Lao Tzu is a master alchemist, producing the finest Elixir of Life in his Crucible of the Eight Trigrams. The Journey to the West calls his home the Tushita Palace—but since the meaning is unknown, I have renamed it the Cinnabar Palace. Cinnabar, or mercuric sulfide, is a prime ingredient in Taoist alchemy. The Western Paradise is where good Buddhists are taken after death—a congenial place where they can progress more rapidly toward becoming Buddhas themselves. This is the teaching of the “Pure Land” school of Buddhism, which predominates in East Asia. The Journey to the West identifies the Western Paradise as the present home of the Buddha and implies a location in India. Elsewhere, it is usually said to be ruled by another Buddha called Amitâbha (or Amida, by the Japanese). And it is located by some as far away as the west edge of the universe. Kwan Yin (or Kuan Yin, or Guan Yin). The Bodhisattva Kwan Yin, commonly called the Goddess of Mercy, is the most popular figure in Chinese folk religion—much more widely loved and worshiped than the Buddha, Lao Tzu, Confucius, the Jade Emperor, or any other divine being. Before the rise of the Chinese Communists, shrines and temples to Kwan Yin dotted China. She has a prominent role in The Journey to the West, often helping the pilgrims out of a tight spot. Kwan Yin’s name means “heeding the cry.” She hears and helps all those who cry out to her in need. She is said also to be the one who delivers children to their mothers. Though Kwan Yin often visits Buddha in the Western Paradise, her home is on the mountain island of Putuoshan in the Southern Sea. (On a map, look for it off the coast of China’s Zhejiang province, just east of the island of Zhoushan.) She is sometimes described as carrying a porcelain vase filled with willow twigs. The four dragon kings live in the Eastern, Southern, Western, and Northern seas. The eastern king is chief of them all, though himself subject to the Jade Emperor. The magnificent palaces and treasure hordes of the dragon kings are legendary. Yama, Judges of the Dead, Land of Darkness. The Land of Darkness is the Chinese Hell. There are both Buddhist and Taoist versions, but they are basically alike. The Land of Darkness is not underground but in a kind of parallel dimension. When people reach their fixed times of death, demon officials arrest their spirits and bring them before Lord Yama, the First Judge of the Dead. If their good deeds balance or outweigh their evil ones, they are sent directly to the Tenth Judge for rebirth. Otherwise, they must first pass before the other judges for punishment of various kinds of wrongdoing. The Tenth Judge decides how and where the spirits should be reborn, according to their merit. Most will be reborn on earth as humans, while the worst will return as animals. Before any spirits return, Lady Meng gives them a drink that makes them forget their previous life. Then they are placed on a huge wheel that sends them spinning to their new body in the Land of Light. Or, in another version, they are thrown into a river that carries them to their destination. Especially good spirits might be brought to the Land of Darkness only briefly or not at all. They might be sent to Heaven to receive official posts, or to the Buddhist Western Paradise, or to Mount Kunlun, home of the Taoist Immortals. As with most of Chinese mythology, there are many variations on these beliefs. Yama, originally an Aryan god, was brought from India to China by the Buddhists. According to some versions, he was demoted by the Jade Emperor to Fifth Judge of Hell for being too lenient. Lady Queen Mother. In The Journey to the West, the Lady Queen Mother is the wife of the Jade Emperor and lives in Heaven. Elsewhere she is often known as the Queen Mother of the West, wife of the Lord King of the East and ruler of Mount Kunlun, home of the Taoist Immortals. In either case, she tends the orchard where the Immortal Peaches grow. Ancient Tales and Folklore of China, by Edward T. C. Werner, Bracken Books, London, 1986; reprinted from Myths & Legends of China, George Harrap, London, 1922. Awaken Healing Light of the Tao, by Mantak and Maneewan Chia, Healing Tao Books, Huntington, NY, 1993. Taoism and Chinese Religion, by Henri Maspero, translated by Frank A. Kierman, Jr., University of Massachusetts, Amherst, 1981. The Eight Immortals of Taoism: Legends and Fables of Popular Taoism, translated by Kwok Man Ho and Joanne O’Brien, introduction by Martin Palmer, Penguin, New York, 1990. The Hsi-yu-chi: A Study of Antecedents to the Sixteenth-Century Chinese Novel, by Glen Dudbridge, Cambridge, 1970. Larousse Encyclopedia of Mythology, Prometheus, New York, 1960. Dear Monkey, translated by Arthur Waley, abridged by Alison Waley, Bobbs-Merrill, Indianapolis and New York, 1973. A further abridgment for young people of Waley’s Monkey (see above). Monkey: A Journey to the West, by David Kherdian, Shambhala, Boston and London, 1992. A novel-length retelling. Special mention should be made of Laurence Yep’s outstanding fantasy series, Dragon of the Lost Sea, Harper, New York, 1982–1992. 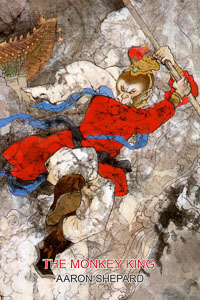 Monkey appears as a major character and sometimes narrator in this original epic tale built on Chinese mythology. Titles in the series are Dragon of the Lost Sea, Dragon Steel, Dragon Cauldron, and Dragon War.